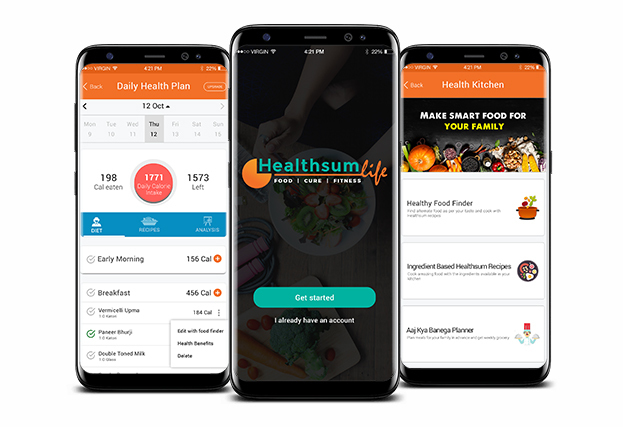 Netgains launched another Health Based Android app “HealthsumLife”, which is not just a calorie counter but a Food & Health management app that can automate your Diet & Kitchen in just a few clicks. As an Android app development company in India, our experienced Smartphone app development team designed an app to enhance demands of the clients. We focused on some important factors when building the app like User Data Security, UX & UI design, Fast Loading Speed, Device Compatibility in various android version. Fitness Test: User has to give fitness test to get BMI (Body Mass Index ) and BMR (Basal metabolic rate) to know his/her daily calorie intake. Health Analysis: User can view health report of last one month about calorie intake and burn, activity, water and weigh log graphs. Food Recipe: User can see daily food recipes and calories according to their Diet Plan. One clicks grocery: User can get automated grocery list for one week in just one click. Food Finder: User can search variety of food items and its recipe with smart search function. User can also find the recipes according to ingredients. One to One real time chat: We have developed complete one to one chat feature for this app, where users and coach can chat on real time. Entire chat session is safe and secure.